Here was my experience this morning. I walked in and handed the young lady my TDL, she seemed very confused and asked if I had my voter registration card instead, I said “no” she took my drivers license and started looking for my name in the voter roll alphabetically by my first name not my last name. I waited for a few seconds to see if she would figure it out, she didn’t so I walked her over to the book with the S’s to get her started, I had to actually find the page for her as she was no where near my name in the book. OK not a huge deal I understand it is hard to get good folks working there, but the fact that she didn’t seem to want my photo ID was a little concerning since it is the law now. I also noticed that a gentleman came in behind me while I was dealing with this and I never saw him give his ID, he had a 8.5×11 folded piece of paper that he showed the clerk. To be fair I don’t know, maybe it was a copy of his license or a receipt for an ID or maybe he gave her his ID when I wasn’t looking but not having an ID didn’t seem to be an issue at my polling place. In fact I don’t see anywhere where the clerk has to sign saying they saw a photo ID. So how anyone knows that is actually being done is beyond me. 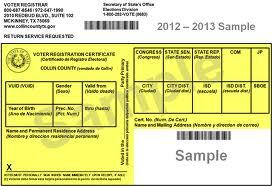 I also don’t see what the problem is with names being a little different between the ID and voter rolls. My middle name is spelled different on my license than my voter registration for some odd reason. I noticed where my name was in the voter roll that there was a printed note that DPS has my middle name with a different spelling. So evidently there is a way for them to already know if there are slight differences in the name between DPS and the voter registration and tie them together I would imagine this would cut down on a certain amount of problems. I thought this was interesting because I have never heard anyone talk about it before when they discuss the issues of minor name differences and the new voter ID law. I think that should be mentioned.